Monkees' pad for a s�ance to summon a relative from beyond. Filmed At: Screen Gems Studio 6, Hollywood, CA and Fred Niles Film Studios, Chicago, IL. Filming Dates: September 19-22, 1967 (this episode); August 2, 1967 (�Daydream Believer� musical number). �Goin� Down� Written by Diane Hilderbrand, Peter Tork, Michael Nesmith, Micky Dolenz & David Jones; Produced by Chip Douglas. As The Monkees prepare for bed, they are frightened by the sound of laughter downstairs. The thought that it might be a burglar sends them scurrying downstairs with weapons and a net, which they clumsily catch themselves in when Peter sneezes. They find Henry Weatherspoon preparing for a séance in their living room. He tells them that they have three minutes to leave before the guests arrive and within seconds the guys race back upstairs, get dressed, pack their bags and a trunk and head back downstairs until Michael objects to Henry using their pad for a séance! Henry explains that their lease states that on this night they have to vacant the pad by midnight till sunrise and even shows them the lease. The guys are about to leave when Henry’s aunt, old Mildred Weatherspoon appears at the door insisting they stay as witnesses for the return of Elmer Weatherspoon from the dead! 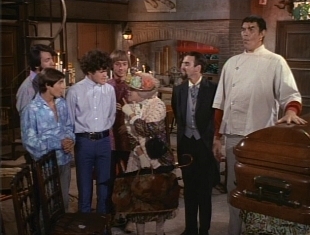 The guys are unwilling to stay to bear witnesses to such an event, but they try to leave only to be foiled by Mrs. Weatherspoon and Henry's cousin Boris Weatherspoon, a giant Frankenstein’s monsteresque goon who is totally under his control. Boris barges in the pad with the coffin containing Elmer’s corpse knocking the door compleetly down off of its hinges. The boys quickly make up their minds and stay to witness Elmer Weatherspoon’s return form the dead, and they imagine a courtroom, with Michael as The Witness and Micky, David, and Peter as the barrister, the defendant, and the judge, respectively. Peter sneezes and Mrs. Weatherspoon convinced it’s a cold rushes him upstairs for tea while Henry sends Boris to fetch their luggage. Henry then reveals to the others that Elmer will return at dawn, heralded by a trumpet (with which he was buried! ), after which, he will leave; frightened once more, The Monkees’ make up their minds again and reattempt to escape but are once again stopped by Boris, bearing enormous suitcases full of his lunch. Meanwhile, upstairs, Mrs. Weatherspoon has Peter in bed giving him several cups of tea to drink for his cold. Henry shows Micky and Michael a bottle of aspirin claiming he invented it in order to bring Elmer back from the dead but Michael accuses him of trying to use it on them in order to make them believe they’re seeing Elmer rise. While David chats with Boris about a High and Low act he once did with a tall person, they wind up doing a “Tea for Two” tap dancing act dressed in vaudeville clothes when they’re halted by disapproving Henry. Soon they all hear Peter crying for help upstairs and everyone heads up there to find that Mrs. Weatherspoon has placed an oxygen tent on Peter for his cold, piling him with all sorts of remedies. David tries talk with Mrs. Weatherspoon about the matter but is stopped by Henry who declares The Monkees are disbelievers and will drive Elmer away. David calls Henry a fraud and Boris begins choking him; Mildred halts Boris and orders him and Henry out of the room. As the two plotters secretly listen on the other side of the door, David learns Mildred will give all of her money to Henry’s foundation should he succeed in bringing Elmer back, as it is the only way to protect her interests. David opens the door and Henry and Boris come crashing down to the floor and Mildred disappears. Everyone finds her bashing Micky with her umbrella to keep him from disturbing Elmer in his coffin until the proper time. Mildred learns that the boys are trying to protect them, she calls them angels, and they imagine bouncing on a cloud in sweat socks, extra–large white togas, and fake wings. Micky’s determined not to stand around and allow the old lady see her money stolen, but everyone’s afraid that Henry will sick Boris on them if they interfere. Both of Micky’s attempts to subdue Boris, first by ramming into his stomach then by trying to use judo on him, fail miserably, he gets a migraine. Mildred offers to remedy his headache with an Egyptian Head Banging Cure by having Micky cover his eyes and then stomp hard on his foot so he’ll forget about his head problem. Micky does indeed forget about it, as he cowers in pain from his foot! Later, The Monkees and The Weatherspoons prepare for the séance as they all take hands. Henry declares that Elmer will be amongst them in a few moments, and when a few elements shake and rattle as he draws nearer, Michael thinks it’s his teeth. Henry attempts to summon Elmer and suddenly the sound of a trumpet playing is heard. When Henry commands Elmer to speak, a ghostly voice calls Henry a crook, cheating the dead and running off with his aunt’s money, and declares that he must pay, driving the frightened Henry to confess. The voice demands he try pleading and begging for mercy; Henry does so on his knees, and soon Micky pops out of the coffin to everyone’s surprise. It had all been just a clever Monkee ploy to lure Henry into confessing his diabolical scheme. Outraged, the former sics Boris on the boys, triggering a wild chase from the pad to the fantasy courtroom to the fantasy cloud set to “Goin’ Down”. The chase ends as Henry and Boris are shut up inside the coffin by Mildred and the boys. Mrs. Weatherspoon thanks the guys for their help thwarting her scheming nephew and leaves. recieve a call by the Boy Scouts who want to offer Micky an officer’s commission. Mike and Peter compliment him on his groovy trumpet and suggest that he tries it with a group, but Micky replies that he doesn’t play the trumpet! The boys turn and suddenly they see the coffin opening as Elmer Weatherspoon’s hand rises playing the trumpet in which all the guys begin coughing in fear. The boys finish with a rendition of “Daydream Believer”. “Goin’ Down” appears here in yet another alternate mix, this time with echo effects. Collector's Note: Rhino has included this alternate take of “Goin’ Down” as a bonus selection on their January 24, 1995 reissue of Pisces, Aquarius, Capricorn & Jones, Ltd. (R2 71793). 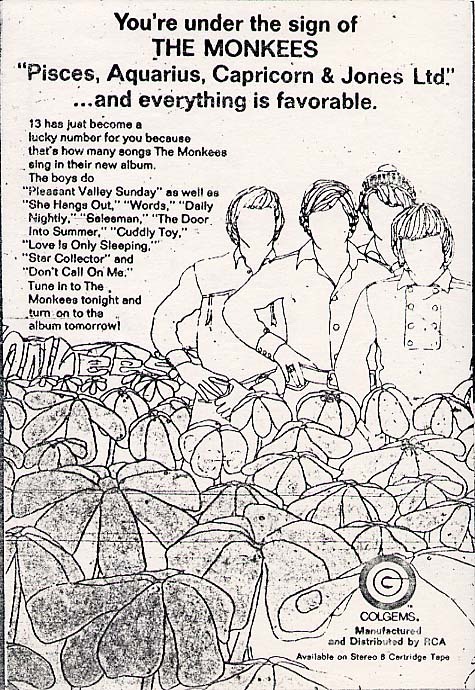 In the week of “A Coffin Too Frequent”'s first-run telecast on NBC, TV Guide ran an ad promoting The Monkees' now week-old LP, Pisces, Aquarius, Capricorn & Jones, Ltd.. Note the couple of tracks used in this episode, “Daydream Believer” and “Goin’ Down”, are flipsides of the Colgems #66-1012 single, issued October 25, 1967. This is last of three occurrences of an episode of The Monkees TV series showcasing flipsides of a Monkees single: the first was the redubbed May 15, 1967 summer repeat of “Your Friendly Neighborhood Kidnappers”, had featured both sides of The Monkees’ third single (#66-1004, released in March, 1967), “A Little Bit Me, A Little Bit You”, b/w ”The Girl I Knew Somewhere”; and a second, the redubbed August 21, 1967 summer repeat of “The Monkees On Tour”, included “Pleasant Valley Sunday” and “Words”, flipsides of The Monkees' 4th single (Colgems #66-1007, issued in July 1967). Director David Winters, who also had a hand at helming Episode No. 57, "The Monkees Blow Their Minds," was instrumental in choreographing The Monkees in their first concert tour in December 1966. Winters previously worked on the 1965-66 NBC primetime music variety series Hullabaloo—which, interestingly enough, The Monkees replaced on NBC @ 7:30 Mondays! The submain title theme for “A Coffin Too Frequent” was dusted off for reuse in the submain titles of Episode No. 58, "Mijacogeo" (a.k.a. "The Frodis Caper"). The brief harp section heard during the scene where David, Micky and Peter imagine bouncing on a cloud as "angels" is the same as the one heard in Episode No. 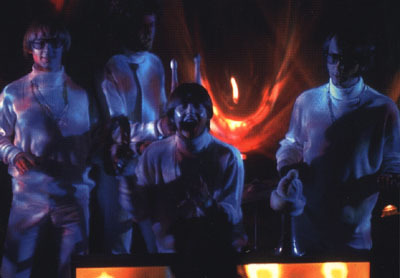 52, "The Devil And Peter Tork", in the scene where Peter starts playing his harp under the command of Mr. Zero (Monte Landis). Stella Linden, writer of “A Coffin Too Frequent,” had one other writing credit: the 1968 WorldWide picture Two A Penny. She is one of only 2 women to contribute scripts to The Monkees TV series, aside from Treva Silverman. When “A Coffin Too Frequent” was repeated on CBS Saturday Afternoon, its soundtrack was revised to include “Oklahoma Backroom Dancer”. “A Coffin Too Frequent” was the 44th consecutive and last filmed Monkees episode to feature Michael Nesmith topped by his beloved wool hat. A white wool hat appears in the “Star Collector” musical sequence, which appears @ the outset of the next episode, "Hitting The High Seas", and No. 55, "The Monkees Mind Their Manor"; David Jones can be seen wearing Michael's hat in his disguise as Santa's helper in Episode No. 47, "The Monkees Christmas Show", and Frank Zappa wears it in his guise as Michael Nesmith in the teaser sequence of Episode No. 57, "The Monkees Blow Their Minds". Trivia Footnote: The original wool hat Nes wore to The Monkees' audition in 1965 was later returned to him at a concert in the late 1990s. The title “A Coffin Too Frequent” is a reference to a play by English playwright Christopher Fry and first produced in 1946 called A Phoenix Too Frequent, which, incidentally and appropriately, is set in front of the tomb of the husband of one of the characters. This is the second Monkees episode to feature a character named Boris (played here by Mickey Morton), following No. 5, “The Spy Who Came In From The Cool” (played by Jacques Aubuchon). We learn here that Peter learned how to read at the age of 15! “A Coffin Too Frequent” is one of 2 episodes of The Monkees where all the action takes place in The Monkees' ramshackle beach pad throughout the entire duration of the episode. The other is Episode No. 27, “Monkee Mother”. David Jones can be seen dancing (with Boris) and singing the tune "Tea For Two." The song was composed by Vincent Youmans (music), Irving Caesar and Otto Harbach (lyrics) for the Broadway musical No, No, Nanette, which opened on September 16, 1925 at the Globe Theatre (New York) and ran for 321 performances, spawned 2 movie versions (released in 1930 by First International Pictures and in 1940 by RKO Radio Pictures), and was revived on January 17, 1971 for a run of 861 performances. (In 1950 Warner Bros. released a movie musical entitled Tea For Two, a reworking of No, No, Nanette, in which its star Doris Day [as Nanette Carter] sung the title song.) In a scene from Episode No. 55, "The Monkees Mind Their Manor", Michael and David appear to be whistling a couple of bars of "Tea For Two." The elongated stationery prop used as the lease to The Monkees' pad in North Beechwood in “A Coffin Too Frequent” previously appeared in Episode No. 14, “Dance, Monkee, Dance”, as Peter's lifetime contract for Renaldo (Hal March)'s Dance Au Go Go. The black gowns worn by Micky and Peter in the courtroom fantasy sequence have been seen a couple of times on the show. An early courtroom fantasy sequence in “Dance, Monkee, Dance” saw Micky (the prosecutor), Michael (the judge) and David (the defense attorney) wearing these robes, and in Episode No. 51, "The Monkee's Paw", Peter, Michael and David wore these black robes as professor's gowns. At the start of the “Goin’ Down” romp notice that Michael Nesmith "skips" off-camera and does not take part at all on The Monkees' Pad set. The only scenes he's in during this romp are those in the courtroom and in the scene where Henry throws the candles at Michael, who is disguised as a Keystone Cop. Also, the “Goin’ Down” sequence offers Monkee viewers a onetime glimpse of The Monkees' laundry room in the pad, compleet with a kiln--despite the fact that an earlier episode, No. 29, “The Monkees Get Out More Dirt”, found them going to a laundromat! The pajamas that The Monkees wear are the same ones from the previous episode, "The Wild Monkees". A couple of drug references are snuck into “A Coffin Too Frequent”. First off, Michael quips that when one takes Henry's pill, “we believe that Elmer came back from the dead! We also see pretty colors and things climbing up the wall...” Also, after David, Micky and Peter's brief appearance as angels, Micky says, “Now, that's a trip!” Other Monkees episodes to feature similar dabbling references are No. 51, "The Monkee's Paw", and probably No. 53, "The Monkees Race Again" (a.k.a. "Leave The Driving To Us"). The trumpet rendition of Call To The Post heard in this episode during the seance scene was first heard in Episode No. 40, "Monkees Marooned". This episode marks the third mention of The Boy Scouts on The Monkees; the first two occurred in Episode No. 7, “The Monkees In A Ghost Town”, and No. 39, "Hillbilly Honeymoon" (a.k.a. "Double Barrell Shotgun Wedding"). A nod to The Girl Scouts is made in No. 15, “Too Many Girls” (a.k.a. "Davy And Fern"), and in No. 24, “Monkees A La Mode”, Michael reveals to have been an Eagle Scout in 1961. David Jones makes his sole appearance on The Monkees with his bangs completely spread apart. He is also seen wearing the same sky-blue clouded shirt he previously wore in the “Valleri” musical number seen in Episode No. 23, “Captain Crocodile” (plus various scenes of the episode) and No. 31, “The Monkees At The Movies” (Jerry Lester, who portrayed Luthor Kramm in the episode, was also seen wearing the shirt), the KRUX radio station sequence in No. 32, “The Monkees On Tour”, and the tag of No. 36, "Monkee Mayor"; Peter can be seen wearing the shirt in No. 13, “One Man Shy” (a.k.a. "Peter And The Debutante"), No. 15, “Too Many Girls” (a.k.a. "Davy And Fern"), No. 16, “The Son Of A Gypsy”, and No. 33, "It's A Nice Place To Visit...", and a scene from Episode No. 20, “The Monkees In The Ring”, finds Micky Dolenz clad in the shirt. Michael previously used the one-liner "Totally nuts!" in Episode No. 40, "Monkees Marooned". Almost a full year after “A Coffin Too Frequent” aired first-run on NBC, The Monkees' feature film HEAD premiered in Los Angeles. Boris knocks the front door off its hinges but later opens it normally. During the romp, Henry is seen throwing burning candles while standing next to a totem pole. Cut to Michael, dressed as a Keystone Kop surrounded by thrown candles, standing against the wall next to the same totem pole. Ruth Buzzi (Mrs. Weatherspoon)'s TV work has included the role of Margie 'Pete' Peterson' in That Girl (ABC, 1966-71), Leticia Bradford in Days of Our Lives, a regular Roaster on The Dean Martin Celebrity Roasts, and, of course, that hip 1968-73 NBC favorite, Rowan And Martin's Laugh-In. Buzzi also appeared in the fourth episode of the first season of The Muppet Show (Synd., 1976-81). Indeed, she was in fact supposed to be the first ever guest star but scheduling conflicts pushed her back to being the fourth. In 1993, Buzzi joined the cast of Seasme Street, playing the role of Ruthie. Trekkies will recognize the late Mickey Morton (Boris) as Kloog from the January 15, 1968 episode "The Gamesters of Triskelion". He also portrayed Solomon Grundy in the live-action Hanna-Barbera January 18-25, 1979 NBC-TV special, Legends Of The Super-Heroes.